Buildings with more than six residential units are not eligible for conversion. 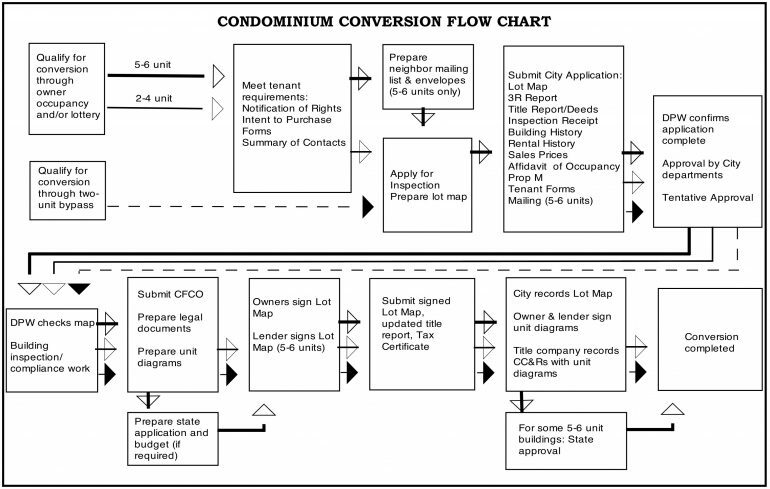 Buildings with 2-4 residential units may qualify for conversion three ways: (i) automatic (lottery bypass) qualification for two-unit buildings where each unit is owner-occupied be a separate owner; (ii) the “Expedited Conversion Program”, created June 11, 2013, under which buildings owned as a TIC as of April 15, 2013, may convert between 2013 and 2020 (however, note that as of July 2017, the City is not accepting ECP applications from buildings with renters because of a recently-filed lawsuit challenging the constitutionality of the lifetime lease requirement); and (iii) the annual conversion lottery, which has been suspended but is expected to return beginning in 2024. Buildings with 5-6 residential units are also eligible for the Expedited Conversion Program, but are no longer eligible to participate in the conversion lottery. This means that 5-6 unit buildings that were not already TICs as of April 2013 cannot be converted to condominiums. Under a recently enacted law, a tenant buyout can also affect a building’s eligibility for condominium conversion. A “tenant buyout” occurs when a tenant agrees to leave voluntarily in exchange for money or other consideration from a building owner. Effective March 2015, all tenant buyouts must be reported to the San Francisco Rent Board, and meet certain other requirements. Any tenant buyout that occurs after October 31, 2014 can disqualify a building from conversion, or delay conversion eligibility. If the buyout involved an elderly (over 60) or disabled person who has resided in the building for 10 years), or if the buyout involved a or catastrophically ill person (regardless of residency duration), the building is disqualified under all conversion eligibility programs. If the buyout involves two or more tenants, none of whom satisfy the “protected” criteria described in the preceding sentence, then the normal owner-occupancy duration requirement under all conversion programs is extended to 10 years. The new law is not clear as to whether the 10 year occupancy requirement applies when two tenants vacate the same unit, or only when tenants vacate two different units; however, we expect the latter interpretation to apply. It is also unclear whether this allow applies only to lottery conversions, or whether it applies to all conversions (including conversions of two-unit buildings bypassing the lottery). As of January 2019, SFDPW is not disqualifying non-lottery conversions based upon buyout history but, because the law is unclear, this the agency could change this policy at any time. Two unit buildings with a clean eviction/tenant buyout history bypass the conversion lottery if both units are occupied for one year by separate (unmarried) individuals who each own at least a 25% interest in the property during the entire occupancy period. This exemption from the lottery is also applicable to mixed use buildings having no more than two residential units, both of which are owner occupied. Occupancy is proven by sworn statement. Vacant apartments do not count as owner-occupied. A two-unit building cannot bypass the lottery if an elderly (over 60 who has resided in the building for 10 years), disabled or catastrophically ill person was evicted from the building after November 16, 2004. Two-unit bypass conversion is also impossible if, after October 31, 2014, there was a buyout of an elderly (over 60) or disabled person, who has resided in the building for 10 years), or a catastrophically ill person (regardless of residency duration). A building from which two or more tenants (regardless of age or disability) were evicted from separate units for any reason unrelated to the tenants’ behavior after May 1, 2005 can be converted only after 10 years of owner-occupancy unless each unit was occupied by a separate owner on April 4, 2006. As noted above, there is written law implying that building from which two or more tenants were paid to vacate after October 31, 2014 similarly must be owner-occupied for 10 years, but SFDPW is not currently applying the tenant buyout law to these conversions. 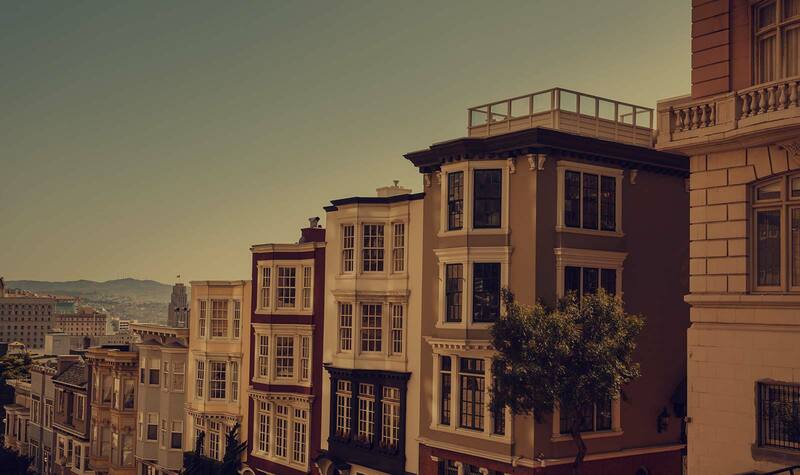 In June 2013, San Francisco created a new condo conversion program under which 3-6 units buildings can bypass the conversion lottery. The new condo lottery bypass conversion is open to buildings owned as a TIC as of April 15, 2013. These buildings may convert between 2013 and 2020, provided they satisfy owner-occupancy and eviction/tenant buyout history requirements. The eligibility requirements for each year of the program are described in the article entitled New TIC Condo Conversion Law. Note that, as of July 2017, the City is not accepting ECP applications from buildings with renters. Buildings with rented units must comply with additional requirements. All renters get an opportunity to purchase after conversion. The tenant can exercise the purchase right regardless of whether the owner wants to sell, but the owner can effectively discourage purchase by setting the price as high as he/she wishes. In buildings converting under the Expedited Conversion Program, all non-purchasing renters must be offered lifetime rent-controlled leases; however, as of July 2017, the City is not accepting ECP applications from buildings with renters because of a recently-filed lawsuit challenging the constitutionality of this lifetime lease requirement. In buildings converting under the lottery system, disabled and senior (over 62) renters get lifetime rent-controlled leases, and other tenants get one-year rent-controlled leases. All tenants must be notified of their rights before a lottery conversion application is filed. Contrary to popular misconception, converted units are not exempt from most rent control restrictions until they have been sold following conversion. But at the conclusion of a lease period, renters may be evicted in connection with the sale of a unit. Because the lifetime lease provisions of the Expedited Conversion Program are so new, many details have not yet been clarified, particularly with respect to lifetime leases. But there is nothing in the written law that prevents a tenant from waiving his/her lifetime lease or prevents an owner from paying a tenant, or offering some other concession or benefit, in exchange for the tenant giving up his/her life lease. Keep in mind that there is a difference between paying a tenant to move out and paying a tenant to waive his/her lifetime lease. Paying a tenant to move out is clearly a violation of the rent control law, and an agreement by a tenant to move out in exchange for money is therefor unenforceable. But paying a tenant to give up a lifetime lease, while continuing to live in his/her apartment as a “normal” rent control tenant, does not seem to be illegal, at least under the written law of the Expedited Conversion Program. Since the City will be recording lifetime lease documents against the building even if the tenant has agreed to waive his/her lifetime lease rights, the paperwork used for such a tenant buyout must be prepared carefully to ensure that the condo can be sold for its full value and that a lender will provide a mortgage based on that full value. Also, because the City is not currently accepting ECP applications from buildings with renters (because of a recently-filed lawsuit), a tenant-occupied building cannot apply for ECP conversion even if all tenants have signed waivers. Before you choose a lawyer to handle you condo conversion or new construction subdivision, take a moment to speak with Cam, Andy, or attorney Rosemarie MacGuiness, at SirkinLaw APC. Our practice includes all required City and State applications and filings, as well as preparation of any governing documents you may need. We offer these services on a flat-fee basis, and our rates are generally lower than those of other firms. Contact us via our contact form.